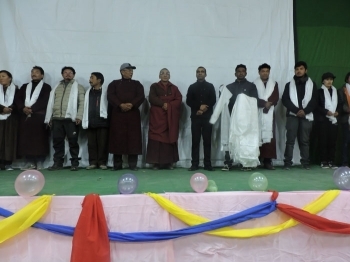 The Ladakhi feature film, “Aama” focused on the women and their relationship was premiered on March 22 at Nyemoling, Community Hall, Leh. The movie was produced by Himalayan Film Studio and directed by Tsering Zangpo Serthi. Talking about the absence of movie hall in Leh he talked about the plan of LBA to construct an event hall at Maney Sermo near Pologround in the years to come. Deachen Chamga, Former President, LMCS expressed the hardship faced by the filmmakers because of the absence of movie hall in the district which further compels them to screen in the community hall. “The unavailability of space to screen new movies discourages many enthusiastic filmmakers to come up with new movies”, he added. So far around 58 movies, 68 video albums and 30 documentaries were made in the last 28 years of LMCS. He appealed the authorities to take up the issue and find a solution for it either by constructing a new hall or repairing the old auditorium hall at Polo ground. The one among the best feature film of Ladakh, “Migchoo” is also been made by Tsering Zangpo. The movie was screened at various film festivals and appreciated by many.